The Premier Novak Djokovic Special Edition. The perfect evening watch for Novak. 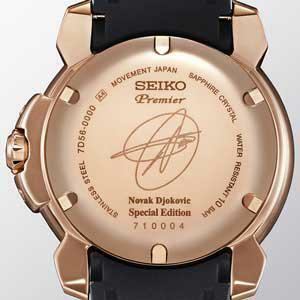 Since Seiko became the watch partner of Novak Djokovic four years ago, we have created several watches for the different aspects of Novak's busy life and, for 2017, we are enriching his collection with a special edition watch that is designed to accompany Novak on formal evening occasions. This watch joins the Premier collection and incorporates Seiko's unique Kinetic Perpetual caliber. The watch is available in two versions and will be launched in September 2017 at leading Seiko retail outlets worldwide. The style is unmistakably Premier. 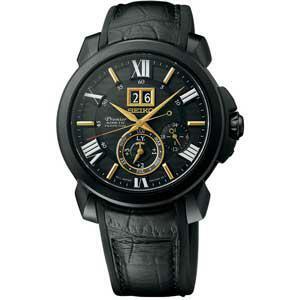 It has the classicism and modernity that have always characterized this distinctive dress watch collection. In creating this watch for Novak, however, we added, at his suggestion, elements of sports design to make it uniquely his own. The combination of a case in a rose gold tone with a black dial adds a dynamic look to the classic design. The strap, too, combines tradition and sport with its hybrid silicone and leather construction and makes the watch both supremely elegant and very comfortable to wear. The dial has a striped pattern, like a perfectly mown grass court and the red tip on the second hand adds a lively but discreet touch. Novak's 'D' emblem graces the crown and the case back carries his signature. Novak reviewed the prototypes and contributed to the design. The set-and-forget convenience of Kinetic Perpetual is perfectly suited to Novak's busy schedule. As in every Kinetic caliber, the wearer's movement powers the watch, but, with Kinetic Perpetual, this energy is conserved in a uniquely practical way. If the watch is unworn, it enters sleep mode and remembers the exact time and date for up to four years. As soon as it is picked up again, it awakes and automatically resets itself to the correct time and date. It even adjusts to leap years, up to February 2100. Each case back bears Novak's signature.